Rain boots are not something I get to use very often. Especially right now, since California is in the middle of a drought, we don't get a ton of rain. Still, I love taking advantage of the few rainy weeks we have in the winter and beginning of spring, and wear my favorite boots around. Hunter Boots are a classic- the black/navy ones go with nearly anything and are wicked good at keeping your feet dry. They don't keep your feet warm though, so don't wear them in the snow, and make sure to wear socks of some kind. I own both the original and kid's sizes, which I'll be comparing below! Sperry's Hingham boots are lined with a faux-fleece material, so they are perfect for keeping your feet toasty. The vegan leather is also okay to get wet, so these are awesome for wading and jumping in puddles. These come in earth tones, so they are super versatile. I was quite lucky to snag a pair of these, since they are rarely available. My two other favorite rain boot brands are Burberry and Joules. I have one pair from Burberry (these ones), which I don't wear very often so I didn't photograph them. I have yet to get a pair by Joules, though! First of all, let's talk about price. The women's Original Tall Rain Boots are $150, while the Original Kid's Rain Boots are $80. They are the same price whether you get them in the regular or gloss finish- my women's are regular finish, while my kid's are gloss finish. The kid's boots are great for people with smaller feet. They go up to a size 5, which is equivalent to a women's 7. I attached a size chart below with Women's Equivalent sizes. The Women's boot shaft height is 16", while the Kid's has an 11" shaft height. On me, that means the Women's hit just below my knee, while the Kid's hit on the upper calf. The calf part is pretty loose, so when I walk, it sometimes rubs against my jeans or leg in the middle of my calf, which can get a little uncomfortable after a few hours in thin pants without boot cuffs. I don't have this problem with the women's since it hits higher on my leg. The kid's boots also have reflector patches on the back, which some people love and some people find pesky. Personally, I'm not a fan of these, and have tried to peel them off, but they're not removable. I wear a 6.5 and I have the size 5 in both women's and kid's. The kid's ones fit me when I'm wearing very thick socks, like J. Crew camp socks or Hunter's boots socks. The women's fit when I'm wearing regular thickness socks. Overall, I prefer the regular women's boots, mostly because of the lack of reflectors. I also like that they are a little taller, so I don't have to wear huge socks to avoid chafing. However, the price difference is quite staggering- $70! Luckily, I've found some great deals on Poshmark, where I got my black women's boots. However, I think Hunter boots are well worth the price for the quality you get, especially if you'll be using them frequently in a rainy area. 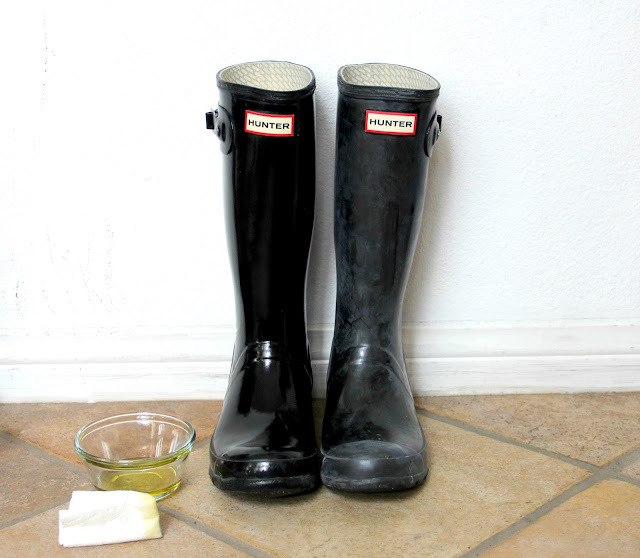 Hunter boots often develop white salt deposits when you wear them out in the rain. Hunter does offer a cleaning liquid and maintenance tools, but they're pricey and there are much cheaper home remedies that work well. The first method is to rub them down with a cooking oil. I had to borrow some oil from my neighbor, and what he gave me was a bit too much. What's pictured is probably double what you'll need. Just a little bit on a paper towel should do the trick! Rub off all the white salt deposits, then rinse it off with water and dry the boot's exterior with another clean paper towel. The above photo is one boot after the full cleaning process and one boot with the white salt smudges. Dish soap and warm water should also work, but will probably take a little longer and require more effort. Make sure your water is not too hot, as it could damage or even melt the rubber in prolonged exposure. What you'd normally take a bath in is fine. Hope this post and guide were helpful! Let me know where your favorite boots are from.